The capital is Yokohama　横浜.
. Yokohama and Chinatown .
. Kamakura　鎌倉 the old capital .
. Kamakura Daibutsu 大仏 - the Big Buddha . A well-loved souvenir from the pilgrimage to Oyama. Local people held kite competitions for the Boy's festival in May 端午の節句. The painting is simple and the colors strong. It flies well, even with little wind. 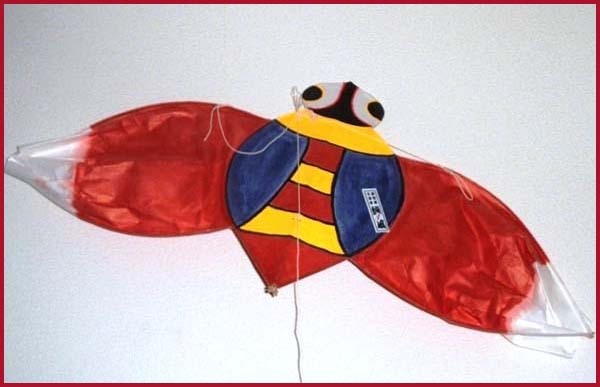 Other kites with insects from Japan are semidako 蝉凧 cicada、chodako 蝶凧 butterfly , hachidako 蜂凧 bee and others. From the temple treasures of 大宝寺 Taiho-Ji. The temple members made it in the Meiji period to earn some extra money. They used bamboo from the forest in the back of the temple and imitated the cicadas, which were quite noisy in the temple compound. 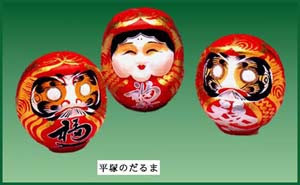 After WW II the production almost stopped.
. Darumadako, Daruma tako だるま凧 Daruma kite . 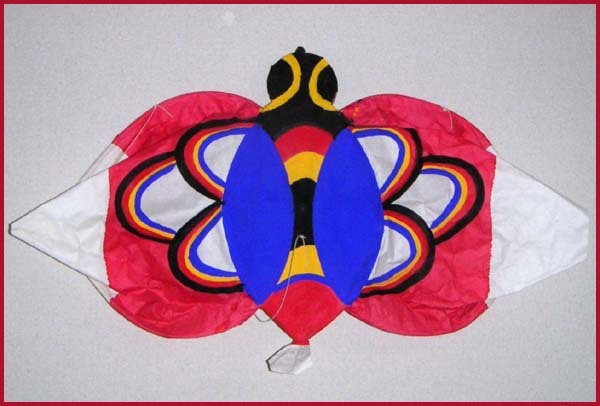 It has a long tail made by rope and is made to withstand strong wind. 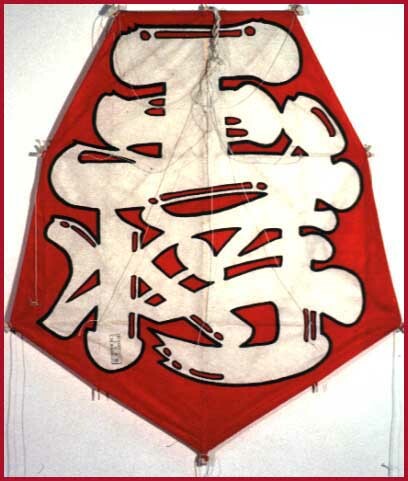 It has a small hummer on top of the kite (yumi unari 弓うなり), which makes the sound of ”ビーン” biiiin . 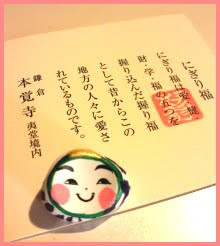 Made first in the early Meiji time by 服部定右衛門 Hattori Sadaemon to celebrate the birthday of a child. Later other villagers followed suit. Later the tradition was revived by 浅岡正幸 Asaoka Masayuki .
. shoogi shōgi - 将棋 Shogi, generals' chess. . This is a mountainous region famous for its wooden toys.
. Hakone yosegi saiku 箱根寄せ木細工 yosegi-woodwork . Wooden Puzzle Blocks are designed so that the rectangular wooden blocks can be assembled to form a certain shape without the use of any adhesive. The number of blocks to complete a single shape ranges from 3 pieces to over 100 pieces, with a variety of different assembling and disassembling patterns. The technique for disassembling the completed blocks is to find that one special block, which is the key to the whole structure. 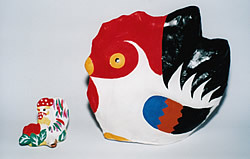 Two birds are mounted on a small whistle. The birds are made from Hakone cedar wood. The head and tail move if you blow the whistle made from bamboo. ji-u ningyoo 晴雨人形 "shine and rain dolls"
. Palanquin, sedan chair (kago 篭 or かご) . 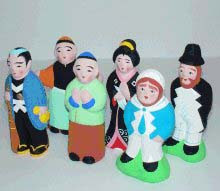 To keep these smiling faces in your hand for good luck, good business and good health. You buy one with your special wish and clasp it every day - until your wish has come true. The temple maidens prepare them one by one for the New Years market of the temple, which is located close to Kamakura station and draws many visitors. 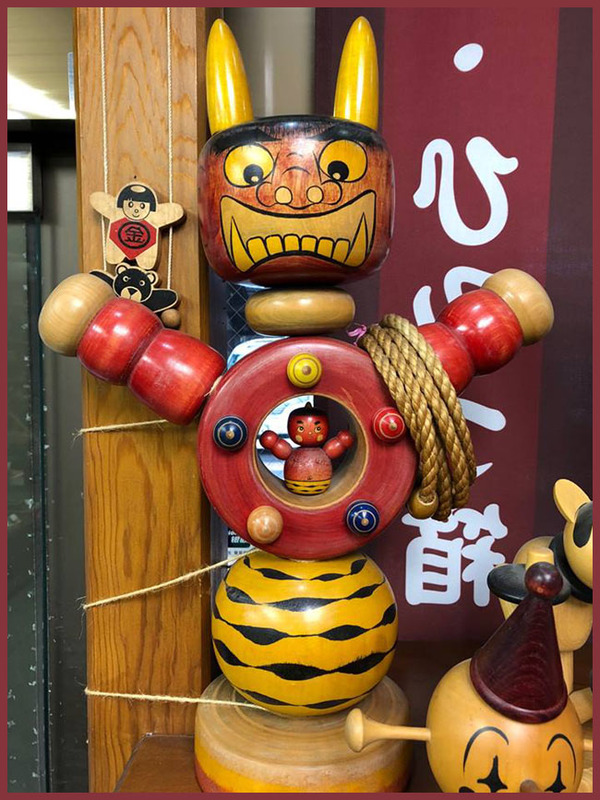 The deity of business, Ebisu, is also venerated at this temple and at the New Years market other amulets of Ebisu for good business are also sold. 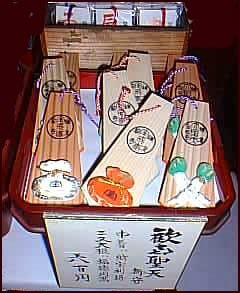 ... pidgeon whistle from shrine Hachimangu . They come in all kinds of shapes and local patterns, mostly the main flowers of temples.
. kaizaiku, kai zaiku 貝細工 craft from clams and sea shells .
. Shichifukujin 七福神尊 seven gods of good luck . at the shrine Kainan Jinja 海南神社 in Miura town, Kanagawa. Jan. 15. Miura peninsula has a pilgrimage to seven temples of the gods of good luck. kyogibune, boats from paper-thin sheets of wood . 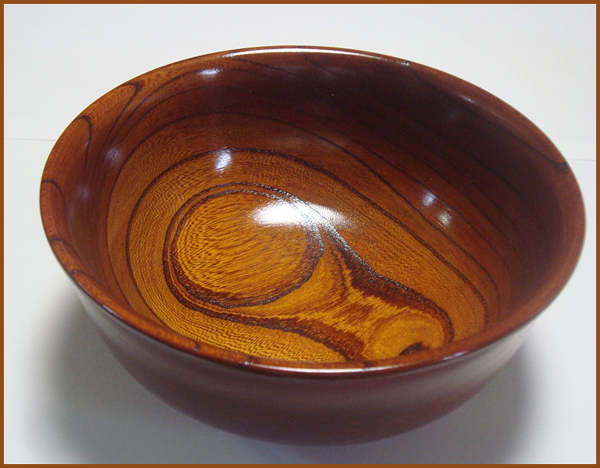 Made from bamboo and wood, but the last maker died a few years ago. Similar dolls are made in other parts of Japan. 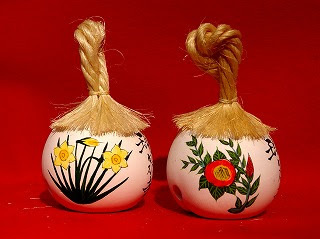 In Japanese culture, there are many bells and ringing instruments made through casting, such as furin 風鈴 (wind chimes) that sing out refreshing sounds during the summer, and temple bells that gently resonate in people’s hearts. In Kanagawa Prefecture, Odawara City has built up an outstanding Japanese casting culture. According to historical evidence, in 1534, during the third year of the Tembun Era (1532-1555), 田 二郎左衛門　Yamada Jirozaemon pioneered the casting industry in Odawara after moving to the area from Kawachi Province, today’s eastern Osaka Prefecture. This is said to be the origin of Odawara casting. Given that this was a period of civil war, it is presumed that there was a very high demand for casting products, including Buddhist ceremonial fittings and statues, firearms, helmets, and even daily necessities such as pots and pans.
. suika Tenjin 西瓜天神 Tenjin like a watermelon slice . Okamura Tenmangu 岡村天満宮 was established toward the end of the 12th century, by a vassal of Minamoto no Yoritomo, Shogun in Kamakura, who had brought an image from the Kitano Tenjin shrine in Kyoto. It was first called "Sugiyama Tenmangu 杉山天満宮".
. Yokohama Kaiko-sai 横浜開港祭 Yokohama Port Opening Festival .
. Kanagawa Folk Toys - this BLOG .